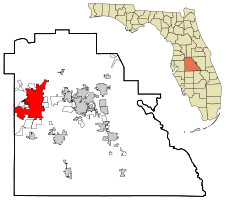 Lakeland is a city in Polk County, Florida, along Interstate 4 east of Tampa. The westernmost city in Polk County, it is part of the Tampa Bay Area. According to the 2013 U.S. Census Bureau estimate, the city had a population of 100,710. Lakeland is a principal city of the Lakeland–Winter Haven Metropolitan Statistical Area (coterminous with Polk County), which had an estimated population of 623,009 in July 2013 based on data from the University of Florida Bureau of Economic and Business Research. It is twinned with Richmond Hill, Ontario; Imabari, Ehime, Japan; Bălți, Moldova; Portmore, Jamaica; and Chongming County, Shanghai, China through the Lakeland chapter of Sister Cities International. South Florida Railroad begins operating. Town platted on land of Abraham Munn. 1885 – Town of Lakeland incorporated. 1891 – Electric lighting introduced. Acton becomes part of Lakeland. 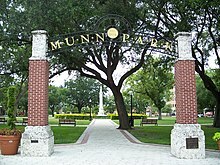 1910 – Munn Park and the Confederate monument were dedicated. 1911 – Lakeland Evening Telegram newspaper begins publication. 1913 – City Hall built. 1915 – Lakeland Morning Star newspaper begins publication. 1916 – Morrell Memorial Hospital opens. 1921 – William Bowles was the last of 20 African-American men lynched in the county since Reconstruction; he had allegedly insulted a white woman. 1922 – Florida Southern College relocates to Lakeland. 1924 – Lakeland Terrace Hotel in business. 1925 – Henley Field Ball Park opens. 1928 – Lakeland Theatre in business. – The first high school is opened for Mooreland black students. 1933 – Junior Welfare League of Lakeland formed. 1935 – Southeastern College of the Assemblies of God established. 1936 – WLAK radio begins broadcasting. 1937 – Roxy Theatre in business (approximate date). 1941 – Lakeland Ledger newspaper begins publication. 1949 – WONN radio begins broadcasting. 1953 – Filmland Drive-In cinema in business. 1957 – WWAB radio begins broadcasting. 1960 – Lakeland Indians baseball team formed. 1966 – Joker Marchant Stadium opens. 1977 – "It snows in Lakeland." 1988 – Lakeland Square Mall in business. George Jenkins High School opens. International Sport Aviation Museum established. 1998 - Lakeland.net website online (approximate date). 2004 – August: Hurricane Charley occurs. 2005 – Lakeside Village shopping center in business. Florida became a state in 1845, and Polk County was established in 1861. After the American Civil War, the county seat was established southeast of Lakeland in Bartow. While most of Polk County's early history centered on the two cities of Bartow and Fort Meade, eventually, people entered the areas in northern Polk County and began settling in the areas which became Lakeland. Lakeland was first settled in the 1870s and began to develop as the rail lines reached the area in 1884. Freedmen settled here in 1883, starting development of what became the African-American neighborhood of Moorehead. Lakeland was incorporated January 1, 1885. The town was founded by Abraham Munn (a resident of Louisville, Kentucky), who purchased 80 acres (320,000 m2) of land in what is now downtown Lakeland in 1882 and platted the land for the town in 1884. Lakeland was named for the many lakes near the town site. In April 1898, the Spanish–American War began and started a crucial point in Lakeland's development. While the war ended quickly and had little effect on most of the nation, the Florida peninsula was used as a launching point for military forces in the war. The then small town of Lakeland housed over 9,000 troops. The Florida boom resulted in the construction of many significant structures in Lakeland, a number of which are now listed on the National Register of Historic Places. 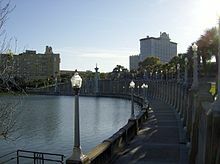 This list includes the Terrace Hotel, New Florida Hotel (Regency Tower, currently Lake Mirror Tower), Polk Theatre, Frances Langford Promenade, Polk Museum of Art (not a product of the 1920s boom), Park Trammell Building (formerly the Lakeland Public Library and today the Lakeland Chamber of Commerce), and others. The city also has several historic districts that have many large buildings built during the 1920s and 1940s. The Cleveland Indians held spring training there from 1923 to 1927 at Henley Field Ball Park. Parks were developed surrounding Lake Mirror, including Barnett Children's Park, Hollis Gardens, and the newest, Allen Kryger Park. The "boom" period went "bust" quickly, and years passed before the city recovered. Part of the re-emergence was due to the arrival of the Detroit Tigers baseball team in 1934 for spring training. The Tigers still train at Lakeland's Joker Marchant Stadium and own the city's Class A Florida State League team, the Lakeland Flying Tigers. In the mid-1930s, the Works Progress Administration built the Lakeland Municipal Airport. In 1938, Florida Southern College President Ludd Spivey invited architect Frank Lloyd Wright to design a "great education temple in Florida." Wright worked on the project for over 20 years as Spivey found ways to fund it and find construction workers during World War II. Wright's original plan called for 18 structures; in total he designed 30, but only 12 were completed. Wright's textile block motif is used extensively on the campus. The concrete blocks he used are in need of restoration. 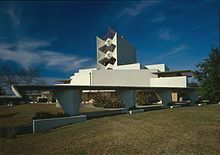 Wright titled the project Child of the Sun, describing his Florida Southern buildings as being "out of the ground, into the light, a child of the sun." It is the largest single-site collection of Frank Lloyd Wright buildings in the world, and attracts 30,000 visitors each year. 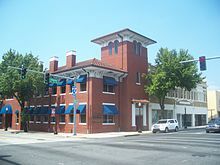 In 1975, the "Florida Southern Architectural District" was added to the National Register of Historic Places. In 2012, Wright's campus was designated as a National Historic Landmark by the National Park Service. At the beginning of World War II, the Lakeland School of Aeronautics—headquartered at the recently-built Lakeland Municipal Airport—became part of a nationwide network of civilian flight schools enjoined for the war effort by the United States Army Air Corps. Between 1940 and 1945, more than 8,000 Army Air Corps and Army Air Forces cadets trained on two-seater Stearman PT-17 and PT-13 biplanes at the school (renamed the Lodwick School of Aeronautics in the midst of this period). From June 1941 until October 1942, 1,327 British Royal Air Force cadets trained at the Lakeland facility. The Lodwick School of Aeronautics closed in 1945. 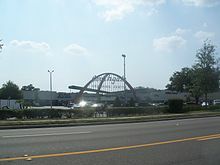 The airport ceased flight operations in the 1960; the site has since then housed the Detroit Tigers' "Tiger Town" baseball complex. According to the United States Census Bureau, the city has an area of 67 sq mi (173.5 km2), of which 45.84 sq mi (118.7 km2) is land and 5.61 sq mi (14.5 km2) (10.90%) is covered by water. Lakeland is within the Central Florida Highlands area of the Atlantic coastal plain, with a terrain consisting of flatland interspersed with gently rolling hills. The dominant feature in Lakeland is the city's many lakes. Thirty-eight lakes are named, with a number of other bodies of water unnamed, mostly phosphate mine pits that eventually filled with water. The largest of these is Lake Parker, which is 2,550 acres (10.3 km2) in size. Much of the culture of Lakeland revolves around its many lakes, and many people use the lakes as reference points in much the same way people in other towns use streets as reference points, such as "I live near Lake Beulah." In addition to Lake Parker, some of the more prominent lakes in the Lakeland area are Lake Hollingsworth, Lake Morton, Lake Mirror, and Lake Gibson. Lakeland, like most other parts of Florida north of Lake Okeechobee, is in the humid subtropical zone (Köppen climate classification: Cfa). Typically, summers are hot and humid with high temperatures seldom dropping below 90 °F and 70 °F for the overnight low. Like most of Central Florida, afternoon thunderstorms are the norm throughout the summer. Winters in Lakeland are drier and mild, with frequent sunny skies. High temperatures range in the low 70s during the day, with lows in the 50s. Rare cold snaps drop temperatures below freezing every few years. Lakeland is governed by a six-member city council. Four members are elected from single-member districts; the other two are elected at-large, requiring them to gain a majority of the votes. The mayor is elected. The City of Lakeland was incorporated on January 1, 1885. The mayor is one of seven members of the City Commission, acting as the board chair and performing mostly ceremonial and procedural duties beyond the powers of the other six. Prior to 1988, the City Commission selected Lakeland's mayor from among its members. Mayors can be on the board for up to 12 years in a lifetime, or 16 years in combination with holding a regular commission position. Since 1988 the mayor has been elected by the city's voters. In 2009 Gow Fields was the first African-American mayor to be elected as the city's mayor. Lakeland made national headlines on September 28, 2006, when Polk County Sheriff's Deputy Vernon "Matt" Williams and his K-9 partner Diogi were shot and killed after a routine traffic stop in the Wabash area of Lakeland. More than 500 police officers from a variety of law enforcement agencies joined in a search for Angilo Freeland, suspected of murdering Williams and stealing his gun. Freeland was found hiding in a rural area the next morning. Nine officers from five different law enforcement agencies surrounded Freeland and shot him when he raised Williams' stolen gun at them. A total of 110 shots were fired, and Freeland was hit 68 times, killing him instantly. Multiple investigations concluded the officers' use of force was justified. Deputy Williams and Diogi were laid to rest on October 3, 2006, after a funeral that included a one-hour-and-45-minute procession to Auburndale. On December 18, 2011, Lakeland Police Officer Arnulfo Crispin was shot and killed after he stopped five young men while on a routine patrol. Crispin was 25 years old, and an 18-month veteran of the force. Kyle Williams was convicted of the killing and sentenced to life in prison. The Lakeland Police Department is recognized as having one of the best-trained canine units in the United States. At the annual USPCA Police Dog Field Trials—the largest competition of police dogs in the United States—Lakeland police dog "Nox" took first place in 2015, "Bruno" took first place in 2012 and 2013, and "Charief" took second place in 2009 and 2011. In October 2010, Officer Rawn Haynes was arrested and charged with negligence for having left a weapon in a car with two young boys. One of the children found the gun and shot the other boy in the hand. Officer Haynes was suspended with pay after his arrest. In June 2011, Sergeant Steven Sealy was suspended from the department for reportedly interfering with the investigation of police Lieutenant Ralph Schrader. Schrader had been convicted in January 2010 of stalking his ex-wife. In July 2013, the county prosecutor released a report that "revealed an extraordinary amount of sexual conduct that was committed both on-duty and off-duty" with a single woman. As a result of the report, an assistant chief of the department retired while five officers were placed on various forms of modified duty. "Had these members of your department been more focused on the important responsibilities of law enforcement, rather than pursuing sexual encounters with a civilian analyst, LPD might not be in the condition it is today", the report concluded. Sergeants Rusty Longaberger and David Woolverton were fired for conduct unbecoming, failure to report misconduct, and neglect of duty. In late January 2014, the State Attorney's Office investigated hiring practices in the department due to allegations of improper handling of the 2012 job application of the nephew of Chief Lisa Womack. The chief had already announced she would leave her position on May 1, 2014. She was placed on administrative leave in January 2014. In 2000, the median income for a household in the city was $16,119, and for a family was $17,468. Males had a median income of $14,137 versus $9,771 for females. The per capita income for the city was $15,760. About 47% of families and 35% of the population were below the poverty line, including 97% of those under age 18 and 9% of those age 65 or over. In 2008–2012, the per capita income was $23,817 and the median household income was $40,284. Persons below the poverty line in 2008–2012 were 17.5% according to the US Census. As of 2000, those who spoke only English at home accounted for 91% of all residents, while 9% spoke other languages at home. The most significant were Spanish speakers who made up 6.4% of the population, while German came up as the third-most spoken language, which made up 0.8%, and French was fourth, with 0.5% of the population. In 1994, the first and only mosque was established. It was called Masjid Aisha, but is now called the Islamic Center of Lakeland. Lakeland is the largest city on Interstate 4 between Orlando and Tampa. Large industries in the Lakeland area are citrus, cattle, and phosphate mining. In the past few decades, tourism, medicine, insurance, transportation, and music have grown in importance. Citrus growing dates back to the early settlers who planted trees in the area in the 1850s. After a series of freezes in counties north of Polk County, the area became the focal point for citrus growing in Florida. Although citrus is no longer the largest industry in the area, it still plays a large part in the economy of Lakeland and Polk County. Phosphate mining is still important to the economy of Lakeland, although most of the mining now takes place further south. The Bone Valley produced 25% of the U.S. phosphate supply. Lakeland's largest employer is Publix Supermarkets. 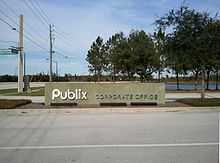 Publix is one of the largest regional grocery chains in the United States with over 1,000 stores across the American South. Publix employs over 6,500 people in the Lakeland area including headquarter and warehouse employees. Lakeland is a transportation hub. FedEx Freight and FedEx Services and the Saddle Creek Corporation employ over 600 people in the area. Other large employers in the area include Amazon, GEICO, Rooms To Go, and Lakeland Regional Medical Center. Polk County is within the Tampa Bay television market. Charter Spectrum is the cable television franchise serving Lakeland, which offers most television stations from the Tampa Bay market, as well as WFTV, the ABC affiliate from Orlando. WMOR-TV, an independent television station, is licensed to Lakeland, with its studios in Tampa and its transmitter in Riverview. Print media include The Ledger, a local newspaper owned by Halifax Media Group. Patterson Jacobs Media Group publishes a magazine, The Lakelander. Lakeland Linder International Airport In 2017, Linder received its first international flight and was renamed Lakeland Linder International Airport in 2018. The 28 elementary schools, seven middle schools, five traditional high schools, and three magnet-choice high schools in the Lakeland area are run by the Polk County School Board. Joker Marchant Stadium, north of downtown, hosts spring training for the Detroit Tigers, as well as their Lakeland Flying Tigers class-A Florida State League and GCL Tigers rookie-league Gulf Coast League minor league baseball teams. RP Funding Center is also home to three indoor sports teams. The Lakeland Magic is a basketball team playing in the NBA G League and is an affiliate of the Orlando Magic. The Florida Tarpons is an indoor football team playing in the American Arena League after relocating from Estero, Florida. The Florida Tropics SC is an indoor soccer team playing in the Major Arena Soccer League. The Tropics organization also operates an outdoor team, the Lakeland Tropics, which competes in the Premier Development League. In the 1980s, the Lakeland Center briefly played host to the indoor version of the Tampa Bay Rowdies soccer team. The Lakeland Center has also hosted a few hockey teams, the Lakeland Ice Warriors, the Lakeland Prowlers, and the Lakeland Loggerheads. The United States Basketball League once had a team here as well called the Lakeland Blue Ducks. Sun 'n Fun was home to Lakeland's only roller derby league, the Lakeland Derby Dames; however, the team was dissolved in November 2015. The Lakeland Center also hosts the Florida High School Athletic Association's state basketball finals. Marvin Pipkin, scientist engineer that had many inventions and innovations for the light bulb. 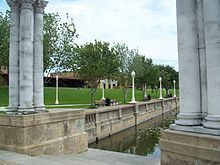 Lakeland Sister Cities International (LSCI), a chapter of Sister Cities International, was formed in 1990 with Lakeland's first sister city Richmond Hill, Canada. ^ a b "Annual Estimates of the population for the Incorporated Places of Florida". US Census Bureau. Archived from the original (XLS) on May 8, 2009. Retrieved November 25, 2007. ^ a b c d e "Lakeland". Viva Florida: History Happened Here. Tallahassee: Florida League of Cities. Retrieved April 21, 2017. ^ a b "Population of Cities and Towns", Census of the State of Florida...1905, Tallahassee: Capital Pub. Co.
^ a b c "US Newspaper Directory". Chronicling America. Washington DC: Library of Congress. Retrieved April 21, 2017. ^ a b c d e f Lakeland Public Library. "Lakeland Timeline". City of Lakeland. Retrieved April 21, 2017. ^ a b c "Movie Theaters in Lakeland, FL". CinemaTreasures.org. Los Angeles: Cinema Treasures LLC. Retrieved April 21, 2017. ^ "History". Junior League of Greater Lakeland. Retrieved April 21, 2017. ^ American Association for State and Local History (2002). "Florida". Directory of Historical Organizations in the United States and Canada (15th ed.). ISBN 0759100020. ^ "Lakeland.net". Archived from the original on January 9, 1998 – via Internet Archive, Wayback Machine. ^ Kevin Hyde; Tamie Hyde (eds.). "United States of America: Florida". Official City Sites. Utah. OCLC 40169021. Archived from the original on August 24, 2000. ^ "Lakeland city, Florida". QuickFacts. U.S. Census Bureau. Retrieved April 21, 2017. ^ a b c "Ancient Native". HOTOA. Archived from the original on October 17, 2010. Retrieved September 9, 2010. ^ a b c d "Polk County History". 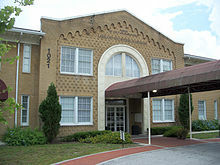 Polk Counjty Historical Association. Archived from the original on July 27, 2011. Retrieved September 11, 2010. ^ "The Ancient Ones". HOTOA. Archived from the original on October 17, 2010. Retrieved September 9, 2010. ^ a b Weibel, B. "Trail of Florida's Ancient Heritage". active.com. Archived from the original on July 13, 2010. Retrieved September 9, 2010. ^ Sawyer, Martha F. (July 8, 1987). "Polk towns named from various sources". Lakeland Ledger. pp. 5C. Retrieved June 6, 2015. ^ "Spanish American War" (PDF). Polk County Historical Quarterly. Polk County Historical Association. June 2003. p. 6. Archived from the original (PDF) on April 2, 2012. Retrieved September 26, 2010. ^ a b "Frank Lloyd Wright's Fla. campus – The Boston Globe". www.bostonglobe.com. Retrieved April 1, 2017. ^ a b c MacDonald, Randall M.; Galbraith, Nora E.; Rogers, James G. (January 1, 2007). The Buildings of Frank Lloyd Wright at Florida Southern College. Arcadia Publishing. ISBN 9780738552798. ^ Sussingham, Robin. "New Frank Lloyd Wright House Constructed at Florida Southern". Retrieved April 1, 2017. ^ Storrer, William Allin; Wright, Frank Lloyd (April 15, 2002). The Architecture of Frank Lloyd Wright: A Complete Catalog. University of Chicago Press. ISBN 9780226776224. ^ a b c d e LEDGER, GARY WHITE THE. "Flight Cadets Attended Lakeland School of Aeronautics". The Ledger. Retrieved April 1, 2017. ^ "Florida's Geological History". University of Florida. Retrieved October 14, 2010. ^ "Measurement of Recovery in Lakes Following Phosphate Mining" (PDF). Florida Institute of Phosphate Research. Retrieved February 4, 2014. ^ "Frequently Asked Questions". Lakeland, Florida. Retrieved February 4, 2014. ^ Diane Lacey Allen (June 23, 2006). "'The Lake is Dry'". The Ledger. Retrieved November 25, 2007. ^ "Florida Lake Swallowed by Sinkhole Reappearing". Associated Press. July 25, 2006. Retrieved November 25, 2007. ^ "World Map of the Köppen-Geiger climate classification updated". University of Veterinary Medicine Vienna. November 6, 2008. Archived from the original on September 6, 2010. Retrieved September 10, 2010. ^ a b c d e f g h i Lawrence Kestenbaum (ed.). "Mayors of Lakeland, Florida". Political Graveyard. Retrieved April 21, 2017. ^ "City Government". Lakeland and Polk County Directory. R.L. Polk & Co. 1923 – via Internet Archive. ^ "Mayor Bill Mutz". City of Lakeland. Retrieved July 11, 2018. ^ Waddell, Lynn (October 13, 2006). "68 Bullets". Newsweek. ^ "Autopsy: Officers fired 110 rounds at man suspected in cop's death". Sunbeam Television Corp. September 30, 2006. Archived from the original on November 13, 2013. ^ Walter, Shoshana (June 5, 2008). "Killer's Civil Rights Not Violated, Panel Says". TheLedger.com. ^ Stegall, Sarah (October 4, 2006). "Thousands Turn Out to Say 'Thank You'". TheLedger.com. ^ Dulaney, Cody (August 26, 2014). "Judge Sentences Kyle Williams to Life in Prison for Murder of LPD Officer Crispin". The Ledger. ^ "USPCA National Field Trials" (PDF). United States Police Canine Association. ^ "2013 National Patrol Dog Field Trials" (PDF). United States Police Canine Association. Archived from the original (PDF) on February 1, 2014. ^ "National 2011 USPCA Police Dog Field Trials" (PDF). United States Police Canine Association. ^ "Lakeland (city) QuickFacts from the US Census Bureau". census.gov. Archived from the original on July 12, 2012. Retrieved December 10, 2014. ^ Modern Language Association Data Center Results of Lakeland, Florida. ^ "First Jewish Settlers" (PDF). Polk County Historical Association. October 2002. p. 1. Archived from the original (PDF) on July 27, 2011. Retrieved September 26, 2010. ^ "Temple Emanuel History" (PDF). Billy. October 2002. Archived from the original (PDF) on July 27, 2011. Retrieved September 26, 2010. ^ Steve, Steiner (August 2015). "Two-part seminar to examine torture, negotiating". The Polk County Democrat. ^ "Religion in Polk". Lakeland. Retrieved September 26, 2010. ^ name="Counting Lakeland's Churches" "Churches in Lakeland, FL". Retrieved December 2, 2013. ^ a b "Lakeland Demographics Guide 2010" (PDF). City of Lakeland. Archived from the original (PDF) on January 5, 2011. Retrieved September 18, 2010. ^ Brinkman, Paul (August 21, 2014). "Amazon welcomes employees in Lakeland; drones in India?". Orlando Sentinel. Retrieved November 20, 2016. ^ "LAKELAND, FL AREA MAJOR EMPLOYERS" (PDF). Lakeland Development Council. Retrieved November 20, 2016. ^ White, Gary (March 3, 2009). "Lakeland Filmmakers Snag Judd Nelson". TheLedger.com. ^ Erickson, Stephanie (October 13, 2005). "Have any movies been filmed in Polk County?". Orlando Sentinel. Retrieved April 25, 2014. ^ "Why Imperial Polk". Polk County Website. Archived from the original on November 29, 2010. Retrieved September 10, 2010. ^ "Trails and Facilities". Retrieved April 5, 2016. ^ Moore, Kimberly C (July 12, 2018). "Airport director on a mission to bring airline service to Lakeland Linder International Airport". Lakeland Ledger. Retrieved July 20, 2018. ^ "Citrus Connection". ridecitrus.com. Archived from the original on December 15, 2014. Retrieved December 10, 2014. ^ "Southeastern University". cappex.com. Retrieved March 12, 2014. ^ "Florida Southern College". US News and World Report. Retrieved March 12, 2014. ^ "About Florida Polytechnic University". Florida Polytechnic University. Retrieved January 30, 2017. ^ "Traviss Career Center | Lakeland, Florida". Traviss.edu. Retrieved November 1, 2012. ^ "Lakeland". webster.edu. Retrieved December 10, 2014. ^ "Club Information". Baseball-Reference.com. Retrieved August 4, 2017. ^ "This is what a program's first home game ever should look like". FootballScoop.com. Retrieved August 4, 2017. ^ "Florida Tropics SC Join Major Arena Soccer League". FLTropics.com. August 29, 2017. Retrieved August 29, 2017. ^ "Orlando Magic begin process of bringing D-League team to Florida". Orlando Sentinel. Retrieved August 4, 2017. ^ "Tropics will play at Bryant Stadium; Dr. Panagiotis Iakovidis is majority owner". LakelandTropics.com. February 7, 2017. Retrieved January 11, 2018. ^ "Roller derby is back in Lakeland". TheLedger.com. Retrieved August 4, 2017. ^ "NPR's Jazz Profiles". NPR. Retrieved September 19, 2010. ^ "Polk Life Magazine pages 52, 53, and 60". Ledger Media Group. Retrieved February 25, 2015. ^ a b c d e f "Most Popular People Born in Lakeland/Florida/USA". IMDb. Retrieved September 19, 2010. ^ "Andy Bean". PGA Tour. Retrieved April 14, 2013. ^ "43 Ahmad Black, DB". CBSSports.com. Retrieved April 14, 2013. ^ "Desmond Darice Clark". databaseFootball.com. Archived from the original on September 19, 2010. Retrieved April 14, 2013. ^ "Lance Davis Stats". Baseball Almanac. Retrieved April 14, 2013. ^ "Matt Diaz Stats". Baseball Almanac. Retrieved April 14, 2013. ^ "Paul Edinger". databaseFootball.com. Archived from the original on September 22, 2012. Retrieved April 14, 2013. ^ "Ronnie Ghent". databaseFootball.com. Archived from the original on May 30, 2012. Retrieved April 14, 2013. ^ "Matt Grothe Stats". ESPN.com. Retrieved April 14, 2013. ^ "Alice Haylett". ALL-AMERICAN GIRLS PROFESSIONAL BASEBALL LEAGUE. Retrieved October 20, 2018. ^ "Lee Janzen". The Ledger [Florida]. Retrieved October 20, 2018. ^ "Ray Lewis". databaseFootball.com. Archived from the original on April 5, 2013. Retrieved April 14, 2013. ^ "Freddie Mitchell". databaseFootball.com. Archived from the original on April 20, 2013. Retrieved April 14, 2013. ^ "Lance Niekro Stats". Baseball Almanac. Retrieved April 14, 2013. ^ "Steve Pearce Stats". Baseball Almanac. Retrieved April 14, 2013. ^ "Maurkice Pouncey". databaseFootball.com. Archived from the original on April 20, 2013. Retrieved April 14, 2013. ^ "MIKE POUNCEY – MIAMI DOLPHINS". Lakeland Football. Retrieved April 14, 2013. ^ "Boog Powell Stats". Baseball Almanac. Retrieved April 14, 2013. ^ "Chris Rainey Stats". databaseFootball.com. Retrieved April 14, 2013. ^ "Chris Sale Stats". baseball-almanac.com. Retrieved November 26, 2012. ^ "Lakeland Ledger – Google News Archive Search". news.google.com. Retrieved March 15, 2018. ^ "Rod Smart". databaseFootball.com. Archived from the original on February 4, 2016. Retrieved November 26, 2012. ^ "Donnell Smith". databaseFootball.com. Archived from the original on January 23, 2013. Retrieved April 14, 2013. ^ "Detroit Tigers trade Lakeland resident Justin Verlander to Houston Astros". The Ledger. Retrieved October 25, 2017. ^ "Chris Waters Stats". The Ledger. Retrieved October 25, 2017. ^ "Charles T. Canady – Chief Justice of the Florida Supreme Court". The Florida Bar Journal. Retrieved April 14, 2013. ^ "Biography of Lawton Chiles". lawtonchiles.org. Retrieved September 19, 2010. ^ "George Jenkins, 88, Founder Of $9 Billion Grocery Chain". The New York Times. Retrieved April 14, 2013. ^ "The Reformer". Christianity Today. Retrieved April 14, 2013. ^ * Kane, Joseph Nathan (1964). Famous First Facts. H. W. Wilson. The first electric lamp bulb frosted on the inside with sufficient strength for commercial handling was invented by Marvin Pipkin of the Incandescent Lamp Department of the General Electric Company at Nela Park, Ohio. On June 29, 1925, he applied for a patent. ^ "Former Legislator Gene Ready Dies at 74 – lkldnow". lkldnow.com. December 15, 2015. Retrieved March 15, 2018. ^ "Charles Z. Smith". depts.washington.edu. Retrieved March 15, 2018. ^ "Biographical Directory US Congress". US Congress. Retrieved September 19, 2010. ^ "Sister Cities". City of Lakeland. Retrieved May 3, 2018. "Lakeland". Florida Gazetteer and Business Directory 1907–1908. R. L. Polk & Co.
"Lakeland". Florida State Gazetteer and Business Directory. R. L. Polk & Co. 1918. Lakeland and Polk County Directory. R.L. Polk & Co. 1923. Federal Writers’ Project (1939). "Lakeland". Florida: a Guide to the Southernmost State. American Guide Series. New York: Oxford University Press. pp. 515–518 – via Google Books. This Was Yesterday: a History of Lakeland, Florida. Junior Welfare League of Greater Lakeland. 1973. Hampton Dunn (1976). Yesterday's Lakeland. Lynn M. Homan; Thomas Reilly (2001). Lakeland. Images of America. Charleston, South Carolina: Arcadia. Paul T. Hellmann (2006). "Florida:". Historical Gazetteer of the United States. Taylor & Francis. ISBN 1-135-94859-3. "(Lakeland)". Florida Memory. Florida Department of State, Division of Library and Information Services.